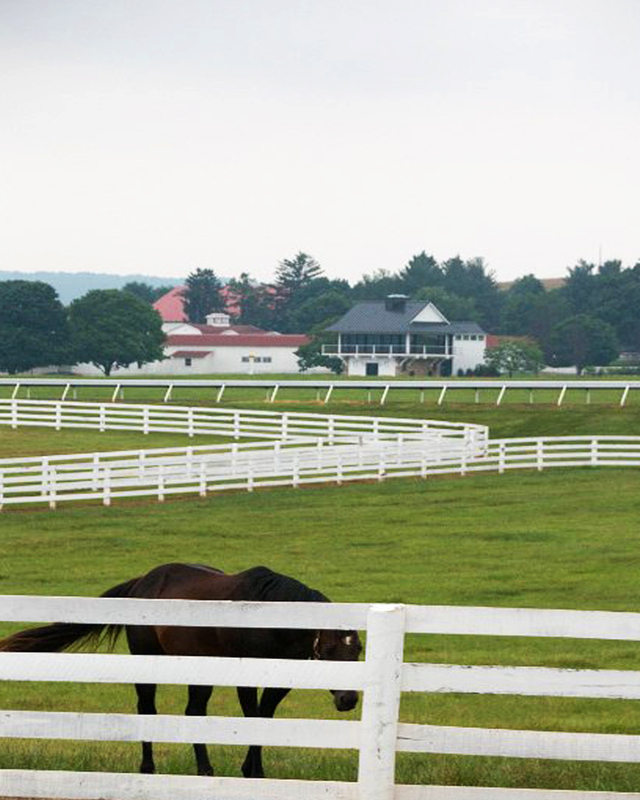 Equestrian art Archives - Blackburn Architects, P.C. : Blackburn Architects, P.C. Fences are one of the most common discussion points among the Blackburn team and clients when we’re designing an equestrian facility. The options listed below are certainly not exhaustive but reflect what we commonly find in many of our projects. Some options are better suited for pastures, while others are more appropriate for small stall turnouts. We’ve tried to identify a variety of approaches that meet the safety needs for horses, limit maintenance needs, and often fall within neighborhood guidelines. 1. Steel rail fencing is an option for stable turnouts. The material is available in a thinner profile so it isn’t as visually heavy and it can be painted black or another dark color so that it does not have the “ranch” appearance seen with galvanized steel pipe corrals. The up-front cost is higher but the material is durable and will have little-to-no maintenance needs. 3. High Tensile Polymer (HTP) comes in both rail and wire styles and is typically mounted on wood posts. The rail is typically 5” wide and from a distance will appear similar to wood board fencing. Because wire fencing has a lower visibility, we suggest using a thicker top board so that the horses can more easily identify the barrier. The HTP materials’ inherent flexibility makes these products durable and resistant to horses leaning on or running into the fence. Typically, these are more suited to large pastures or for perimeter fencing and less so for stall turnouts. The darker colors tend to exhibit a chalky appearance over time. 4. Rubber fencing is a durable, flexible, and low profile fencing material and is similar to the HTP fencing. We’ve not seen this product used as often and we understand that there’s a risk that the strings of the fabric (which is an internal support for the rubber) can become exposed and offer a hazard for horses to chew on. A hot-wire at the top of the fence may combat this risk. The advantages of rubber, HTP or any type strap fencing is the posts can be set further apart which is useful when its highly visible and you want to minimize the number of posts. The fencing is flexible and resists breaking when a limb or tree falls on it therefore it’s a good material for perimeter fencing large acreage and where it encounters wooded areas. This is safer if/when a horse runs into the fence; especially a problem on larger paddocks when horses can get some speed and not be able to slow down. A job interview is not exactly an expected set up for an art sale. So when Lauren Zucker (now Richards) came looking for a job at Blackburn Architects some years ago, she found one. One she didn’t accept because graduate school had a stronger pull. But in a strange twist, John Blackburn liked the student artwork she showed in her portfolio so much he bought it. Two beautiful Lauren Zucker black oil bar on paper works hang in the Blackburn Architects’ offices in Washington, DC. 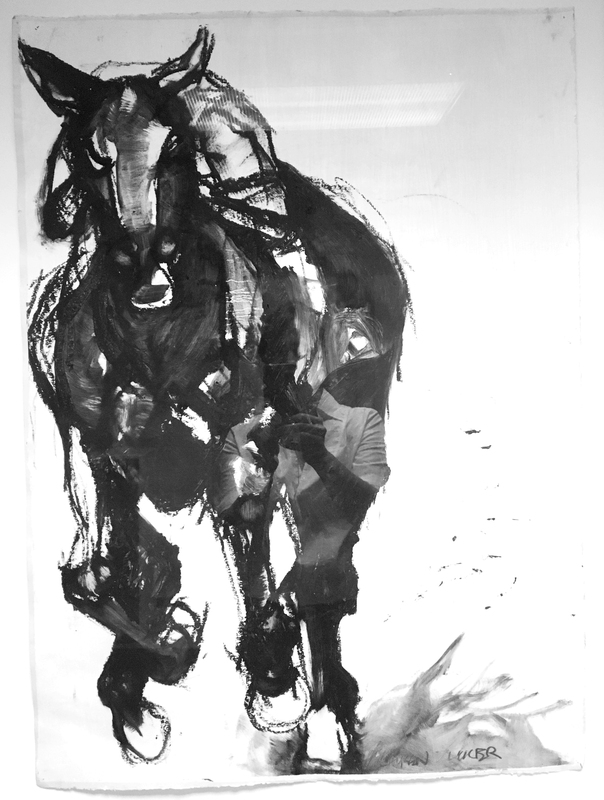 The large 48’x60’ framed paintings are captivating for the brush strokes evoking the fevered jostling of racehorses leaving the starting gate. They are lovely paintings, and visitors to the office often comment on them. The Race: Within the conﬁnes of 10 furlongs there are meta-corporeal aspects of the horse race never experienced by the spectator. I ﬁrst knew the horse race as an unfolded experience through the medium of literature. Drawn out in detail were the visceral relationships between horse and jockey, the operations/politics implicit in a racing farm, the strategies and traditions of breeding and training, the excitement of race day morning, and the cognizant thought behind every move during the course of the race. The race compresses into 2 minutes, the life experience of each racer- horse or jockey. The Drawing: Through drawing, I looked to fold the life narrative of the racer into gesture. Then, as in the race, montage the narrative of different racers. I found inspiration for expressing this agony of entanglement in Picasso’s Guernica. The narrative gesture of war is apparently not unlike that of the horse race. The process of these drawings was subtractive, many beginning as a coat of black oil bar. The slow drying time of oil bar and linseed oil allowed me the time to carve the horses’ bodies out the blackness. 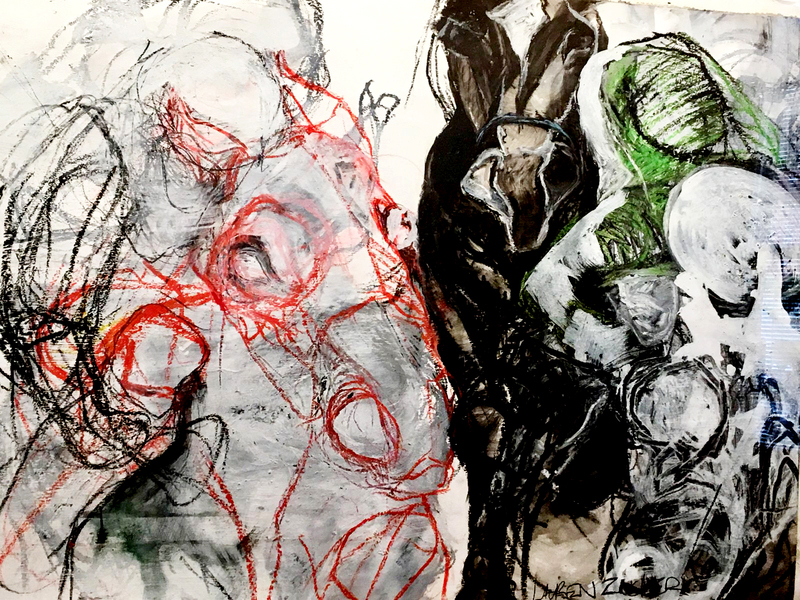 Portions of the drawing were reworked over and over again, conveying motion/time lapse through the multiplicity of elements, such as the doubling of the jockey’s hand in different positions. As time passed, though, Lauren’s identity was lost to Blackburn Architects. We could make out most of her signature in the lower right hand of the paintings, but was it Lauren Ziker, Zucker, Luker? What had become of the artist who made the art we live with every day? Was she still an artist? A practicing architect? We didn’t know. Finally, John was inspired to track Lauren down through a connection to a colleague who knew her and had kept in touch. And voila! Lauren is indeed still an artist, and an architect, and she was so excited we had tracked her down.